The AQWorlds Battle Cards Game! It is OFFICIAL! Our card game will be in-stores at TOYS-R-US on April 18th! ...and we made you a video! 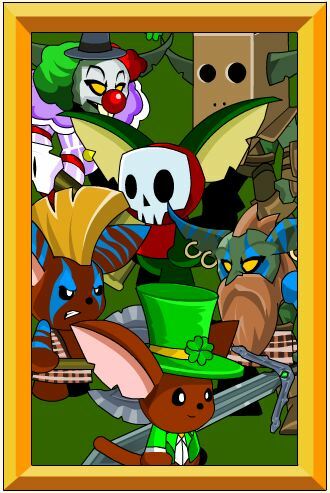 Visit the AQWorlds BattleOn Battle Cards Website for more! I am so excited about this card game... it is hard to believe this is really happening. ...and yes... that is my dentist. ...and sushi chef. You can imagine the fun Galanoth and I had running around taking all of that footage, LOL. Xyo and I are working on a card fight video that should be posted for you tomorrow! HeroSmash has begun PHASE III of Alpha... and it has a shiny new website too! You may remember helping to vote for One-Eyed Doll online a month ago.... well congratulations to you all and to Kimberly & Jason for being voted Austin, Texas' #1 Punk Rock Band! They also released a brand new music video for the song "Fame & Loathing" on their website! Yesterday Cysero confirmed that the "Chinese Madonna" Ayi Jihu will be appearing in our next LIVE AQWorld's special event! Dage's "Prometheus Armor" is going live in AQWorld's Limited Quantity Shop tomorrow starting at 1:00 PM EST (server time)! 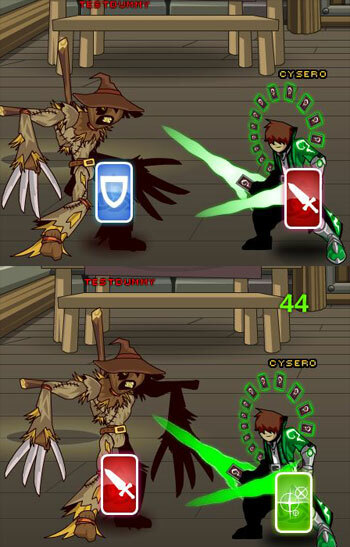 The new card game comes with an exclusive color customizable class for AQWorlds... the CARD CLASHER CLASS! Minimal has coded completely unique skills for this class... it is unbelievable! We really hope you support the game by getting the AQWorlds Card Game when it launches! This collector's class features never before seen card-type skills! Fear Chaser Event Coming to AQW! Ayi Jihu is not an ordinary musical artist. Don't get me wrong, she is a very talented chinese-born performer who speaks more languages than she knows what to do with. She has a huge number of fans from all around the globe and a laugh that can stop traffic but there is something a little different about her. She can also see and do battle with people's fears. Ayi Jihu is the FEAR CHASER and she is coming to AQWorlds on April 15th in a special fear-fighting musical event! Her musical message is a very positive one. After rising from a humble farmer's daughter to one of the hottest up-and-coming artists in all of Asia she has come to understand that your own fears are the greatest obstacle between you and your dreams. She's trying to get the message out there that ANYONE can achieve anything they want... rise to any height... if they just have the courage to stand up and face their own fears. You can expect Ayi's music to be featured in the event and she has been kind enough to agree to do her own voice acting for the event. As usual, there will be a pre-show merch shop and an Achievement Badge but the event is still under construction and Ayi and the AQW team need YOUR help to complete it. We will pick your greatest fears and work them into the event! Let us know on the Forums in today's Design Notes Thread! Limited Quantity Shop Returns THIS FRIDAY! You can expect to see Khuddar and his Limited Quantity Shop THIS FRIDAY starting at exactly 1:00 PM server time. This time the shop will contain 5000 of Dage's Prometheus Set. That is 5000 Armors, 5000 Helms, 5000 Capes, 5000 Weapons. There will also be a few alternate helms and maybe an additional weapon that will match the set. Or course you can expect to see the remaining 2900 color Custom Plague Scythes and probably a few other items in there as well for members and non-member gold. Total Set price: 3200 ACs for all that you see in he picture above. Alternate helms, weapons and other item prices are to be announced at the shop's release. The shop will last 1 week. If there are any left-over items then they will return in the shop next time until sold out completely. NONE of these items will be returning to AQW. Once they are gone, they are gone forever. Happy to say that we are expanding Stratos' Skyguard storyline by adding a new Skyguard Hover-base on Friday. It will serve as the hub town when we eventually continue the storyline further and expand it to an entire aea. You will need to have completed all of the quests in /join airship before you will be allowed to land the Phearless at the Skyguard's mobile base of opperations, but once there you will find a pet shop, a hair shop, an item depot and several Skyguard Reputation Quests. Stratos will be the Rep Vendor for the area. Some of you may have noticed a pretty new button in Battleon. It's a new advert system that we are working on bring to AQW. Clicking this button will get you some nice free stuff that has been sponsored (SponZard, get it?) by some of our friendly advertizers. You might get a Gold boost or XP Boost, maybe a health potion that makes you glow gleaming white or something else. The button won't be there for everyone and it's not there all the time, but if you are one of the lucky few that it might randonly spawn for then help yourself to the free items! We're still working the bugs out of the system so clicky at your own risky! The Sandsea Saga comes to a close…ALMOST! After thousands of years of imprisonment (and after weeks of us hunting him down), Tibicenas the Chaos Djinn is finally FREE! You and Zhoom must follow Tibicenas into the Djinn World and stop him before he takes his vengeance on the King of the Djinn, Efreet... and on the rest of Lore. Thought the other Chaos Lords put up a fight? Had trouble with Wolfwing, did ya? Just wait until you encounter Tibicenas. This Chaos baddie has a new battle mechanic armed with a life-stealing AOE. But wait—there’ more! Tibicenas has 40,000 HP, a 20% chance to Crit, a 30% chance to Dodge, and goes Berserk once his HP falls low enough. You better have a Healer (or two!) in your group if you hope to defeat this Chaos Lord. So let’s say you beat Tibicenas. Itchin’ for a tougher fight? Talk to Efreet to try your luck against Ultra- Tibicenas! Only the most powerful Members will be able to take on this dangerous foe. Not only does Ultra-Tibi come stacked with a whopping 100,000 HP and an 80% life-stealing AOE, he also has a new ability that will stop you right in your tracks. His Petrify spell cannot be dodged and cannot be undone… and since you can only have 7 heroes in this particular map… you had better hope that your battle-buddies are well-armed and ready for a long ‘n crazy ‘n heated battle against Ultra-Tibicenas! Both forms of Tibicenas are LOADED with item drops… but the ONLY WAY to get the Color Custom Zhoom Armor, Zhoom’s Dragonbow, and the Efreet Amor, Hair, and Face helms is by being a Member so that YOU can partake in the Ultra-Tibicenas battle! Quibble is staying in Battleon for one more week! And he’s got the new Malani Warrior set in stock! The Malani Warrior Armor, Malani Warrior Turban, and Malani Scimitar are Completely COLOR CUSTOM! So play around with Base, Trim, Accessory, and Eye Colors to become the most unique Malani Warrior that Lore has EVER seen! In addition to Quibble’s awesome new swag, the Chaos Sphinx will now drop the Sphinx pet, new items in the Sandsea Rep Shop, the Harpy in the Djinn world will drop her headdress, Tibicenas drops 7 items (including his Djinn armor morph! ), and Ultra-Tibicenas has 8 items for you to obtain…if you can defeat him that is! But there’s more! 13 more items, in fact. In the player suggestion shop! All of the items in this shop were inspired by our fellow players! All of the items here were inspired by your fellow players from our Forums. Wanna submit your weapon or armor ideas, too? Head to the forums with your masterpieces because you never know if – or when -- your idea will make it in game and used by thousands! Woah. Now that’s a lot going on tonight. We wish you the best of luck in the Chaos Lord showdown and hope your weekend is a great one. BATTLE ON and ON and ON and ON until you get those item drops! We have a LOT of stuff going on again, so I'm going to tell YOU guys about some of the things you might care about. Keep in mind that for everything we TELL you that we are working on there are abiut 5 other things that can't tell you about. Reens and Stratos (the Lead Moderator and her Moderater Majordomo) are looking for new mods for AQWorlds (and HeroSmash), and now is your chance to apply! One thing Reens needs to stress - you MUST be over 18 year old. If you are under 18, if you don't include your age, or if you start with "I'm not 18 yet, but..." the application will not be considered. 6. C.V. (Resume) *please note we'd like the CV in English. Please send your COMPLETE application to beamod@battleon.com . If the application is not complete, they toss it out. And please - one application per person. Reens and Stratos will read all the applications. If you are chosen to go through a further interview, they will contact you. Unfortunately, they cannot reply to everyone. If you do not hear from us, sorry. Announcing the NEXT Limited Quantity Shop featuring Dage's Prometheus Set! The next LQS opens at 1:00 PM EST (GMT -4 now thanks to Daylight Savings Time) on April 1st (As much as I love messing with people, this is not an April Fools Joke). The Shop Will Include 5000 of the Prometheus Armor, 5000 of the Prometheus Helm, 5000 of the Prometheus Back Item, 5000 of the Prometheus Sword (shown above). Each of the items listed above will cost AdventureCoins. It will also include a few extra items of various prices and quantities (some AC some not) and the rest of the unsold Scythes from the last LQS. There will be a female version of the armor. It is NOT color custom. Prices will be higher than Quibble's (as one would expect from a Black Market vendor) but may or may not be announced ahead of time. You may be asking yourself why we're opening the shop at 1:00 PM when a lot of you are still in school or work or doing something else. I told you that I would roll a random time EACH TIME we opened the LQS to give everyone a fair shot of being first to get the items. I rolled my dice and the dice do not lie. I rolled a 13 on my beloved D20. That means 13:00 hours or 1:00 EST. If I rolled a 20 (CRIT) I would roll my D4, if I get a 4, we stick with 20:00 hours. If i get a 1-3 it means I roll again and add the D4 to the D20 for 21:00 - 00:00 (that's 24) hours. I could have just written a random number generator to pick the hour but dice are more fun. There is a reason I wanted to be the Luck enhancement vendor. with 5000 rather pricey AC items they will probably last more than 24 hours, but if they do not... maybe next time I will randomly roll the perfect for YOU! For another week after this Friday. Little guy has to rest his feet. HeroSmash Alpha Phase 3 TONIGHT! If you haven't been following Artix's Play-By-Play on over at HeroSmash, tonight we open our newest game to anyone who has EVER upgraded in any of our games (even EXPIRED AQw upgrades), Anyone who has ever purcahsed AdventureCoins (AExtras are not purchases), anyone who has ever purchased Battleon Points for their Master Account, or anyone who has ever purchased Varium for EpicDuel. You will also that account attached to your Master Account. If you meet these requirements then you WILL be able to play HeroSmash Alpha Phase 3 starting tonight at 6:30 EST and experience level 10, try out the new mix-n-match powers system that lets you pick and equip your own powers to customize your hero (or villain's) abilities! Come log in and help us try and smash our HeroSmash servers! After thousands of years, Tibicenas the Chaos Djinn is FREE and seeking revenge for his millenia spent as an outcast. Follow Zhoom to the Djinn World, Pit your friendly Djinn, Saahir against Tibicenas to save The Efreet... and all of Lore from the insane corruption of Chaos. 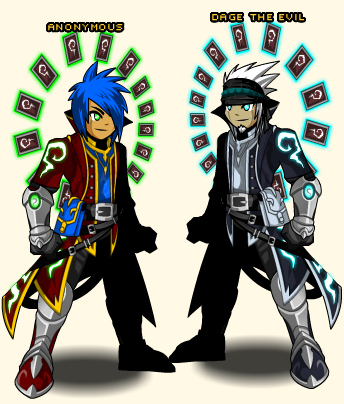 There will be FOUR new armors in this release including a Chaos Lord Tibicenas Armor and Zhoom's Sandsea Ranger outfit! Remember that if you haven't completed all of the Sandsea Quests then you WON'T BE ABLE TO BATTLE THE CHAOS LORD! Fight the Next Lord of Chaos this Friday! This is the moment we have all dreaded. We all knew that we would have to fight the next Lord of Chaos… but who knew Zahart’s djinn was actually the Sandsea Chaos Lord?! We’re all about the element of surprise here. *snicker* Tibicenas is Chaos Lord number… 6? Or is he 7? Are we still counting the Twins as the second LOC? Where did they disappear to, anyway? And was Kimberly the Mythsong Chaos Lord or was it Discordia… and do they count as the same number? OH right—Tibicenas! Giant crazy Chaos Lord djinn out to destroy the world. How could I forget! The HeroSmash Alpha Phase 3 is coming! If you have upgraded in any AE game and linked that account to your master account, you will be able to log in and play HeroSmash—Phase 3—starting Wednesday evening, March 23rd. Be one of the first to try out the new superpower system! 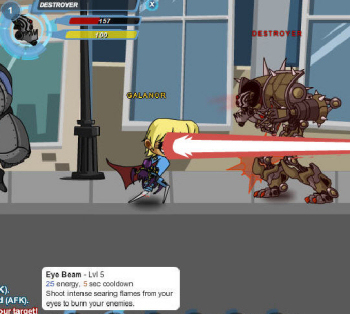 Flaming power punches, laser eye blasts and more will be available to use against your enemies! Zahart has finally awoken his Chaos Beast...the deadly Sphinx. Classically the Sphinx is regarded as a wise creature full of riddles, but the only riddle THIS Sphinx poses is how to survive his BRUTAL onslaught. I will go ahead and tell you that this fight is NOT for lightweights. The level 45 Sphinx monster has unusually high hit points and hits pretty hard. It doesn't take a lot of strategy one of your friends SHOULD bust out their Healer or Acolyte armor. You will, of course, earn a Chaos Sphinx Achievement badge in your Book of Lore for defeating yet another Chaos Beast. There are several very nice drops for members and non-members in this release but it might take you a while to get all of them from the Sphinx. Next week... face the Chaos Lord of the Sandsea! And he's got TWENTY ONE all new items for you, like the Celestial Sandknight armor, with matching Helms, Wings, Spear, Sword, Axe and Claws all of which have color custom accents which apply your accessory color to the whole set for your own custom look! You will also find the Ra Armor from Polistar and a number of Nightshock items and weapons from Xyo so you can impress them with your godly might or shock them with your electrifying power! Or maybe you are more interested in Xyo's EXTREMELY customizable Agile Racer armor, which you can color customize with your Armor, Trim AND Accessory color. Perhaps you'd be interested in Skyline's Obsidian Katanas which will appear to have either red or blue highlights completely at random! Maybe you're more interested in some of Lodarazs' Color Custon wings or some of the other items that will vainsh soon and may never return. You never know how long Quibble might stay. May be a week. Maybe more. Enjoy the release and have a great weekend. During the live release, we pushed a few client changes live and, as usual, we missed a few items. You may have noticed that the TEMPORARY ITEM inventory and the HOUSE ITEMS shops in /buyhouse will open an old-style shop with nothing in it. You also won't be able to close said dead shops. A temporary fix has been put into place. Temporary Item Inventory and the shops in /buyhouse should now work as intended. Thanks Minimal! Coming Today - CHAOS BEAST FIGHT! No, the Chaos Beast is not Rebecca Black. ... dramatic pause for 5 seconds... In tonight's brand new release we will face the Sandsea desert's Chaos Beast. Did you ever wonder what they Chaos Beasts really are? And why a new rune lights up behind Drakath in each cutscene that follows it? Um. Probably just a coincidence. If you are just joining us, or have not completed the Sandsea quests yet... play all of the quests and get ready... for the GRAND FINALE! It feels good to be green. Okay so there’s bunches of stuff going on right now. And since you won’t be blinded by my favorite font color as usual, I’m inviting you to come join me in reading this wonderfully festive DN post! First thing’s first: wishing Happy Birthdays to our friends and family! Both my mother and my sister are celebrating their bdays today along with Randor the Red’s grandmother and sister! Wow—what an incredibly lucky day! Hrrrrm… what are the chances of having your birthday on St. Patty’s Day? “One in 365,” says Cysero. …Right. Anyone else’s birthday today? If so… HAPPY BIRTHDAY! Remember: the Cloverfield Stalker Armor in the Lucky Day Merge shop will be going RARE! So this is your LAST CHANCE to grab a piece of AQW history! Quibble’s Coming Back to Town! Even more luck! Everyone’s favorite traveling sales moglin is making his way back to Battleon with his treasure chest LOADED with brand-new-never-before-seen-items… unless you’ve seen previews from our Twitters! Hehehe. Breaking our lucky streak already? As if Zahart hasn’t already caused enough problems over in the Sandsea… he will on Friday night as you and your friends journey to the legendary Sand Castle. 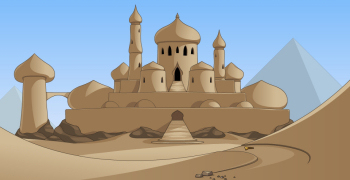 This large palace withstood the Sandsea’s unruly sandstorm and Zhoom believes this is the last place Zahart is hiding. War Mummies and War Hyenas patrol this ancient temple, forever guarding the greatest deity of the Sandsea: the Sphinx. The heart of the Sphinx has been lost in the sands of time (literally) so no one knows why Zahart would go after the immobilized creature. As long as you are caught up in the Sandsea storyline and have found yourself a Djinn, you and Zhoom can journey to the Sand Palace to make sure Zahart’s plan at awakening the Sphinx are foiled! In a dragon hatchling-sized summary, a new war mechanic was added on Monday. Tuesday marked the remodeling of a very popular house item: the Armor Closet! Yesterday, DragonFable heroes got unlimited bank storage for every item bought with Dragon Coins. And today, Dragon Amulet holders will be able to show off your fancy achievements on your character pages! 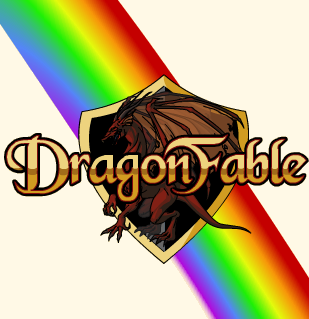 For a full detailed list, why not head to the DragonFable Design Notes? Or just log in to DragonFable NOW and experience everything yourself! You think all that’s awesome? Ohhh… just wait until tomorrow when DF releases the best feature yet! The recent events in Japan have affected the entire world. Our wonderful friend Kimberly from One-Eyed Doll wants to selflessly help the relief effort. 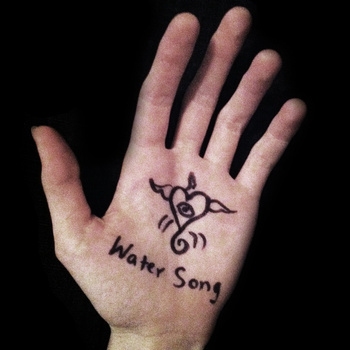 Water Song is dedicated to our beloved Japanese fans and families who have lost so much in this event. Profits from this download from now until 4/1/2011 will be donated to victims of the recent tsunami and earthquake disaster. Please, if you have it in your hearts (and wallets), any donation is happily accepted and know that YOU can help make the Japanese disaster a little less tragic. Head to One-Eyed Doll’s website and make any donation to help this great cause. On behalf of all the players of AQWorlds and our other games, Artix has made a donation of $5,000 to the Japanese Red Cross Society. We hope this contribution helps in the relief effort. You can visit www.RedCross.org for information on how you can help too. Since Friday night is literally a day away, there are bunches of things you can do in preparation for tomorrow’s release. Here’s a lovely list so you can check each one off as you finish ‘em! 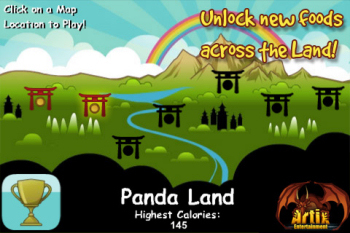 Get Fat Panda for your Android phone for only $0.99! And, of course, Battle On! Fat Panda App now available on Android Market! It’s finally here! Our first ever App is now available on the Android Marketplace! In a world where the ultimate food fight rages on, Fat Panda needs your help at becoming the Fattest Panda of them all. Saturate your blubber bear with complex carbohydrates as you gulp, slurp, fart and burp your way to high caloric victory. Features 8 calorie-consuming levels of buffet-style pandemonium, 20 unlockable achievements from Grease Monger to Milkshaker to Ultra Caloric, a highest calories consumed counter, and explosive gameplay (…literally!) right at your fingertips! Eeeeeeeeeeeeeeep =D I am sooo totally excited and haven’t been able to stop playing! Yup. That’s right. I’m typing with one hand right now while playing Fat Panda with the other. So I apologize for any tpyos or run-on sentences or misplaced links beca—OMGwhyarethereSOMANY derpwatermelonsmakingabeelineformypanda?!!1!!?one!?!! My panda's highest calorie intake is 282. Can you beat that? I wanna give a great big panda hug and an even bigger thanks to the Team responsible for such an awesome game. Without the hard work from Yorumi, Jemini, Safiria, Lodarazs, Warlic, and your goofiest & pinkest friend, Fat Panda would have never been possible…or playable!... on Android Phones. 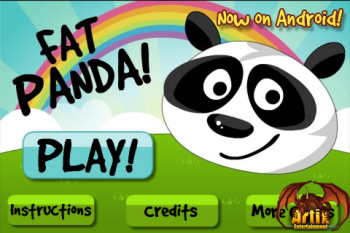 Don’t worry—Fat Panda is coming SOON to an iPhone near you. Warlic gave me the reason as to why Fat Panda is taking longer for approval in the iPhone App Store… but I forgot… because I was too busy typing these Design Notes AND playing Fat Panda on my Droid…! LOL whoops! Wats with the fat pandas? Oh…haven’t you heard? You’re tellin’ me you don’t know the story behind Fat Pandas? You can read more about the entire Fat Panda history here! 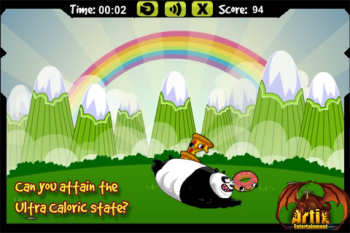 Get Fat Panda on your Android Phone now for only $0.99! For a long time, everyone with a gold name has been called a Mod (short for Moderator) but there are actually 3 kinds of people walking around with gold names. Mods, Testers, and Devs (short for Developer). Moderators and Testers are usually loyal fans and supports of the game who are helpful and patient with new players, fun, friendly yet responsible with the other experienced players. As we need help moderating the growing game we bring on more moderators and we almost always look for players (usually over the age of 18) like the ones i just described above.For the most part being a Mod is a volunteer position, although they do enjoy other rewards like free memberships, free ACs and access to pretty much any item they would like. You might see Reens (the Lead Mod) and Stratos (the Mod General) running around the game with some of their team muting people who try to spam chat, flood chat or curse or possibly handing out kicks and bans to players who are being rude and trying to ruin other's fun in AQW. Testers also do exactly what the name implies: they test our releases to make sure we squash as many bugs as possible before sending something out to you guys. They are not in-game moderators and cannot mute/kick/ban any other players. Devs develop the content for the game. Content can be anything from writing quests and cutscenes to building weapons and armors to crafting the beautiful maps and bacgrounds to programming the game so everything works! Devs build AQW. As we need help building the game we usually look to our community to find some talented volunteers to help craft items and adventures for you. Most of the Dev positions start as volunteer (Assistant Dev) and if things work out, it may turn into a paid position as a part of the AdventureQuest Worlds team. We try to only take on volunteer developers who are 18 or older. RARELY an exception will be made, but the chances of that are slim to none. I'm sure you've seen me, Artix, Alina, Beleen or some of the other Dev's running around. Dev's have all the same powers as Mods plus they get to create content for the game on a weekly basis. That keeps us very busy so we usually leave the moderation to the very capable Mod team but sometimes when we see someone breaking the rules we are forced do a little moderation on our own. Although we both have gold names we have very different responsibilities, and the criteria we use to finds Mods is very different from what we look for in potential Devs. Testers usually start out by being a mod or dev on another game. RARELY we will put out a call for new testing help. I think that's only ever happened once before, though. Now you know the difference but we will all probably just keep calling everyone a Mod. It's eaiser sticking to one name and it's not like you can tell the difference between one gold name or another. The luckiest day of the year is rapidly approaching… so we are celebrating Good Luck Day all week long! Adorn yourself in green leprechaun attire and wield shamrock blades while searching for the end of the rainbow. Legend says that a pot of gold resides at the end of every rainbow… but there is only one way to find out if it is true or not! Smack a Sneevil: Smack ‘n Whack pesky Sneevils ‘til they don’t come back! Jackpot O’ Gold: Test your strength (and your luck) with this classic carnival game! Hedge Maze: Can you find the secret well in the middle of this massive maze? Clover Fields: Watch for the last shiny clover and pick it for the highest Ticket prize! Rainbow Run: Play a Sneevilchaun and collect as many Gold Coins as you can! But wait--there's a new feature we JUST added! There are A LOT of prizes to be won in the Shamrock Fair. 45 of them, in fact! You might have to head to the bank and throw some stuff in because you don’t want to miss out on getting these rockin’ Shamrock Fair Items! All of these items in Mog O’Rahilly’s shop are Seasonal Rares… except one. Polistar made the Cloverfield Stalker Armor just for you, and it will be going permanently Rare once the event is over. This is the only item in this shop that is selling for ACs while all the others require Golden Ticket turn-ins. Wanna earn 2x the amount of Golden Tickets? You can purchase a Lucky Hat from the Fair-y Faeries in front of the Shamrock Fair to double your Golden Ticket payouts! But Beleen! I’m running low on ACs! Well don’t worry my friends; you’re in luck! You can use our AExtras special offers system to earn FREE AdventureCoins. Just click here to check it out. By completing each offer from our sponsors, you can win free ACs and get your hands on the Lucky Hat in no time! Ragnar has made his way to Battleon with the Asgardian Armor set! AQ Classic fans will recognize the armor that the Norse warrior is wearing. Only the greatest heroes will be able to buy the Asgardian Set from Ragnar along with all the other items from the upgrade shop. The only way you can get all this super sweet swag is by being a Member! If you have supported us by upgrading, then you can be one of the first to show off the Asgardian Armor set. Thank you for helping keep AQW alive and running, because without you wonderful guys and gals, none of this would be possible!! J6’s Cousin is a Mad Green Inventor?! J6’s cousin needs some help! David is a self proclaimed Mad Green Inventor and is on the hunt to “find his true self”…ermm, whatever that means. If you are looking to do some of the oddest, weirdest, and most difficult-est quests in all of AQW, head to the Frozen Northlands and /join David! J6's cousin is a giant, too! This is just one of those funny ha-ha additions we do around the game. It actually took a great deal of new functionality and I gatta give a hand to Yorumi for making it possible! On behalf of the entire AQW Team, we hope you have uber amounts of fun during this special clover-filled release. We have NO idea how we managed to conjure up this HUGE of a release in 5 days… but we did have a lot of motivation and support from players like you! And a lot of luck, too. And coffee. Mmmm. Just keep your hands off of it. It's gets finger prints like you wouldn't believe. First, let's look into the IMMEDIATE future, shall we? The far-flung date of tomorrow. As the mists of time part for us a new Shamrock Fair Minigame is revealed. Luckee the moglin invites you to play Shamrock Smash. Shamrock Smash is a break-out style minigame where you reflect a ball off of Luckee's shamrock shield and bounce it into the sky to destroy bricks. Some will break, others will not. Some will give you bonus points, others will explode and take your ball with them and still others will release THREE balls onto the field. What level will you be able to make it to? How many Golden Tickets will you be able to take home? Speaking of Golden Tickets there will be a BUNCH of new items in the prize booth, including 4 new armors! Let my crystal ball guide you over to tomorrow's Battleon where you will find Ragnar. You AQ Classic fans will recognize the armor that the norse warriror is wearing. Members will be able to buy the Asgardian Set from Ragnar starting tomorrow, along with all the other items from the upgrade shop. All the way to mid-April. 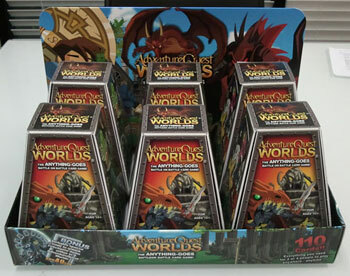 We finally got the packaging samples back from the printer and this is the first photo of what the AdventureQuest Worlds Anything Goes Battleon Battle Cards Card Game (Artix thought of the name) will look like on the shelves of U.S. Toys R' Us stores. If you can't get to a Toys R' Us in the United States, fear not. My crystal balls tells me that a few weeks after it's Toys R' Us release you will be able to order the Battle Cards directly from HeroMart which delivers all over the globe! Don't forget the card game comes with the bonus non-member Color Custom CardClasher Class! Further... Further Into The Distant Future! As we gaze through time into the distant future we can see some interesting Membership perks on the horizon. I see two new Achievement Badges... The first is for people who have had a membership for 3 or more months. I see that this Achievement will appear on your Character Page as well as in your Book of Lore. I see that the badge in the Book of lore will open a shop which will contain ANOTHER armor set from AQ Classic... The Battle Tested Axe Master Armor! I also see that when this Achievement arrives, the armor set will be NON-MEMBER, but you will need to have purchased at least 3 months worth of AQW membership to unlock it. My crystal ball is showing us that there will be ANOTHER Achievement Badge for people who have at least 15 MONTHS worth of total membership purchases (the memberships will NOT need to be consecutive). This Achievement will ALSO appear on your Character Page and In your Book of Lore but it will unlock an exclusive non-member CLASS. This is the future we're talking about and it's hard to see this far. I can't... quite... tell you what the class will be yet but I can see that these two member bonuses will be a PERMENANT addition to AQW and that they will be retroactive too. That means that if you EVER had a 3 month membership you will unlock the first achievement and if you have EVER had a total of 15 months worth of membership you will unlock BOTH achievements, even if you are currently a non-member. Don't fear. As we grow closer to the time we will be able to see the class. The vision is going... going... gone. See you tomorrow on Lucky Day! See What Happens When I Do Things By Myself? Let me start by saying Happy International Women's Day, Happy Mardi Gras and Happy Pancake Day. Why did we pick Pancake Day last year to celebrate, instead of one of the other two concurrent holidays? Two reasons, first and most important, it's PANCAKE DAY. It's a silly holiday and we're all about the silly. The second reason is that LAST year we celebrated INTERNATIONAL Pancake Day, which is in February. Today is the actual Pancake Day as recognized in most English Speaking countries. The Grand Master Lunch Lady Oishii as returned to Battleon bringing with her a few silly, pancake based items including the Full Stack helm which is my favorite helm in AQW. You can find her in Yulgar's Inn but watch out, you will probably get hit at random by her flying flapjacks of doom! We had all the files ready yesterday so when I turned on my computer this morning I thought I would kick Pancake Day off. As with most releases, large or small, I gave a 10 minute warning before the servers shurt down and restarted (a necessary part of most releases) but at the 2 minute warning I noticed that last year's Chinchilla With Syrup was still in the shop instead of this year's rare Pink Chinchilla W/ Syrup (one of the rare Member/AC items in the game. Yay free storage!). They are both very silly pets and not hugely desirable but rare is rare and fair is fair. I was able to get the pink chinchilla into Oishii's shop a mere 35 seconds after the servers went back up. Due to caching issues i'm sure a few of you got last year's rare pet so... well done. That was some fast clicking. I had to kick everyone out of Yulgar to make sure that the properly coded map was live. That was kick 1. The someone on Twitter pointed out that I was no longer selling the Luck Enhancements from my warm and sudsy bath upstairs. This was because I built the map on last year's map before the Stats release. I remembered to put the Giant's tale in Yulgar's chat box but I forgot my own. Once I had re-added my current chat box to the map and sent it to the live servers I had to kick everyone out of the map. Suddenly another of my extremely helpful Twitter followers pointed out that Yulgar was wearing my clothes. Apparently all of the files used to make the Yulgar NPC had the same name as my own NPC so when I fixed my chat box I over-wrote all of Yulgar's clothed with my own. I ran back to the file and quickly got Yulgar back into his own Innkeeper clothes and again sent the fixed Yulgar's Inn file to the live servers. To make sure everyone say the fix I was forced to kick everyone out of Yulgar. Again. Again. That was kick 3. 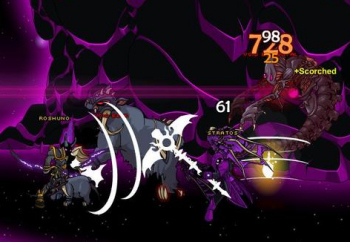 Once more I flew back to the file and asked Yulgar what was wrong with him. He looked at me pointedly. I replaced THAT Yulgar file with the correct one and sent the file to the live server. To guarentee that everyone had the most recent version of the file i was forced to kick everyone out of Yulgar's Inn. Again. Again. Again. That was kick 4. SO, if you were one of the people who was awake this morning and suffered through being kicked out of Yulgar's Inn time and time again, that is why and I appologize. Not my best day ever. I'd also like to thank AQWwiki contributor and new AQW Mod Mturf for adding this as an entry to the wiki so I can relive this day any time I want. Big thanks there, buddy. Friday is Your Lucky Day! This Friday the Shamrock Fair will be returning to the game for another limited engagement. You will be able to play all of last year's great Shamrock Fair Mini-Games (plus one all new mini-game) and gather Golden Tickets to buy all of last year's returning Seasonal Rare Items or any of the NEW Seasoal Rares which will be coming to the shops. 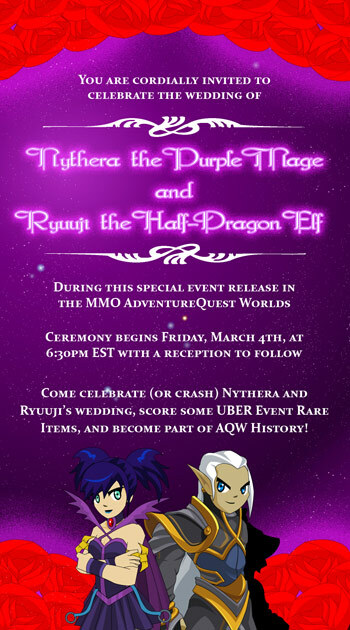 Nythera is to wed Ryuuji the Half-Dragon Elf… and you’re invited! Love is in the air! Nythera the Half-Dragon Purple Mage is tying the knot in real life and in game! This is a very special release for everyone here at the lab and all of our friends… including you! We couldn’t possibly be more excited to see the head of AE Player Support getting married to her life-long friend, Ryuuji. Morale is at an all time high! Although their love is ever-lasting in real life... Nythera in game isn’t exactly excited about the marriage… because it was pre-arranged by her parents from birth! During tonight’s release, it will be up to you and your friends to save the big day and become part of AQW History! Travel deep within the Void to never-before-seen areas and help Nythera find a loophole in her wedding contract. Brand new Void monsters can be found patrolling this unexplored landscape along with bunches of new quests, new zone music, amazing cutscenes, and—of course—new items! Did you say... NEW ITEMS!?!?!! Not only are the Void baddies loaded with drops, the Event Rare shop in the Void Temple has some of the most AWESOME items we’ve ever seen! Some are Member only, some are ACs, and some can be obtained by everyone who joins (or crashes!) the wedding ceremony! There are 18 Event Rare Items in the shop that are up for grabs. Dage the Evil, Xyo, J6, and Lodarazs really went above and beyond making these spectacular armors, helms, capes, and weapons for you to show off during Nythera’s special day. As Event Rares, these items will only be available for a limited time, so make sure you get these items before the Event closes next Friday! Dage the Evil’s birthday was on Wednesday! He has a special shop in Battleon that is selling some of his personal items, including that Dark Caster Armor that EVERYONE loves! This shop will be leaving this Monday, March 7th, so make sure you get these items before they go RARE. And since Dage IS evil… I don’t think he’ll be releasing these items ever again. Really, it is because of you that we are able to create this game and host one-of-a-kind events like this one. Whether you helped by upgrading to Member, making suggestions, supported us by getting AdventureCoins, squashed bugs, clicked on ads, tested new features, or helped your fellow players on the forums -- you are the reason this game is online for everyone to enjoy! Thank you! And Marriage ON! AQW is a family friendly game, which means we try and keep it reasonably clean. It's part of the reason that we restrict chat to people 13 and up (that's a law, actually) and part of the reason we put a profanity filter into open chat. Recently, we've been doing some work on the chat engine and it's had some mixed results. Cursing in the game has dropped off dramatically but some of you have noticed that you can't say certain very common phrases because they contain curse words in them. Of course some people will always try and find a way around a chat filter, no matter how good it is and at SOME point we're doing more harm than good limiting you guys to what you can and can't say. One player even compared AQW to being at school. Yikes. We never intended to make chatting no fun and if we wanted to limit you to canned chat then we never would have written the open chat engine in the first place. Changes needed to be made, and fast. I'm happy to announce that I have just left a meeting with Artix and Minimal and Min has come up with a pretty excellent solution for the chat issue. Pretty soon you should see your chat returning to normal, without stopping you from saying things like "put it", "an alt", "reputation", "its hitting me" and other common phrases while still keeping AQW's E-10 ESRB rating! As I mentioned before, nothing is perfect and some people will always come up with creative ways around the chat filter, and that's when you need to just report that person for abusive language then add them to your ignore list. It's a little late in the week to get the chat changes in by tomorrow's release but we should have no problems getting them in by NEXT Friday's release. Thanks for your patience, sorry about taping your mouths shut and see you tomorrow at Nythera's Wedding! 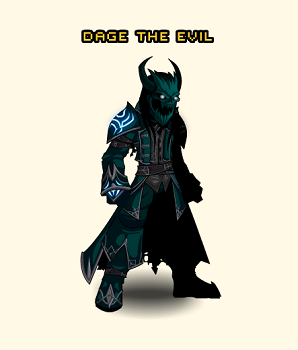 Happy Birthday Dage the Evil! The Dark Lord of the Undead Legion Leveled Up! It’s your favorite evil artist and animator’s birthday! Dage the Evil not only leveled up today, but he’s also in Battleon waiting for you to wish him a happy birthday! He’s also got a shop where you can FINALLY get the Dark Caster Armor, Necrotic Deathday Helm, and the Dark Caster Bday Hat! Dage will be stayin’ put until Monday… or until he gets bored and returns to…um…wherever he’s hidden inside Lore. =D Make sure to wish Dage the Evil a happy birthday in game and on his twitter! This Friday: Nythera, the hard-working half-dragon in charge of AE Player Support is getting married this weekend and and you're all invited! About 1000 years ago, The Purple Mage's parents arranged her marriage to Ryuuji, another very magically talented half-dragon. Just one problem... Nythera has NO interest in getting married, no matter what her parents agreed to. She thinks she can get out of the marriage contract promising her to Ryuuji but she will need your help and Ryuuji will stop at nothing to win her heart. As promised, there will be a number of rare items including (but not limited to) some AC rares and since so many of you have been asking for it through e-mails and tweets, the Violet Eternal Flame back item will be one of them. Tomorrow, March 2nd is Dage The Evil's Birthday and to celebrate he has decided to come to Battleon and offer you some of his items, including the highly anticipated Dark Caster armor! For you Dage The Evil fans, this will be one of the only times when you can grab a few of his items for gold/ACs instead of buckets full of Legion Tokens. These items will ONLY be in game starting tomorrow March 2nd, until Monday Mar 7th. The shop will open sometime during the day. Dage has requested that the armor price be set to 2000 ACs as he has previously mentioned over Twitter. I just don't want anyone surprised by this. There has been a lot of recent discussion about bugs and I wanted to adress these concerns and also ask for additional help from you guys. Some people are concerned that they haven't seen any progress on some of our bigger (actually huge) ticket items. Specifically Guilds, Name Changes, Gender Changes and PvP improvements. Please understand that each of these projects are fairly big to enormous and require a LOT of time and effort on behalf of the entire team especially considering that we release new content every week, and not just a hat or two but usually a full adventure with music and at least one animated cutscene. Even comping up with a concept for an easy and fun way for you guys to build and run YOUR OWN guilds while keeping the game family friendly is a challenge, much less the back end. Name Changes require changing the entire flow of the Login process to require a Portal Account among other things, plus deciding how far back to go and sieze names of innactive accounts which is bound to make a few returning players mad. PvP is a constant pain, which requires real-time positioning (so you see your enemy where is, instead of where he sees himself so you're not attaching his ghost image whule he wails on you from behind. It's a lot more calls than normal positioning within the game (except for the Ledgermayne battle). Balancing PvP against PvE (Player versus Environment) is an uphill battle that every MMO has to come up with a solution for (and the most popular MMO on Earth still struggles with) especially in trying to keep up with player demand for new classes, which is one of the most constantly requested game additions. Lag. It's like snot. Everyone has it and, no matter what you do, it is sometimes unavoidable. Making a Flash based MMO gives us the power to reach a LOT more people than we ever could if we made a console RPG or an MMO that required a client download. A very large amount of our players play from internet cafes and librarys. Unfortunately Flash has some drawbacks and one of them is that it's very prone to lag, but some of it also comes from older computers, slower browsers, intermittent internet connectivity due to the ISP or a wireless connection and some of the lag comes from the servers as well. I'm sure you've noticed how hard it is to log in after a restart. That is because everyone is trying to crowd into the servers at the same time and just like a real door... it gets clogged when everyone tries to run through at once. We are always fighting lag and we are really sorry for the lag you experience. Each of these items presents their own unique challenges plus keep up with our weekly release bugs and some of those are game-crahsers. Here's where you come in... WE NEED BUG REPORTS. Everytime we get a bug report we try to replicate it to see if it was a real bug that we can track and fix or just a code-hiccup. We go through the bug reports for EVERY release in GREAT DETAIL and try and fix every bug that we can duplicate, but we can't fix the broken bits of AQW without your help. Please, when you encounter a bug go to the AQW Bugs Forum and REPORT IT! The more details you can give us the faster we can get it fixed. There are sections for just about every kind of issue you can imagine and without your detailed bug reports, we don't know that they are there.